How many times have you ever had a less than stellar barbecue cooking experience? If you are serious about cooking, then we imagine you understand exactly what we are talking about. 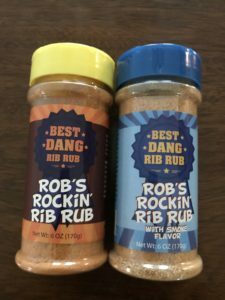 Rob’s Rockin’ Rib Rub is a result of many of these barbecue trials and tribulations. Rob’s entire barbecue life has been an evolution. This evolution started with tried and true southern barbecue from the Memphis area where both he and his wife first tasted real deal barbecue. Up to then, they thought BBQ was grilling chicken or burgers on a small direct grill. One Christmas Rob asked Santa for a real smoker so he could try and make the great barbecue they had tasted back from those Memphis area joints. When Santa delivered, that sent Rob on a real search for the perfect seasoning for the ribs they had loved in the past. After about a year and half of mediocre or less than spectacular results Rob finally came up with his Rockin’ Rib Rub. His wife even coxed him into making a version of the rub with smoke flavor so she could do ribs in the oven that would mimic his slow smoked ribs. We used this stuff on a ton of different items but found that it indeed rocked everything pork we tried it on. We also learned that this stuff needs to be used very generously. Our test ribs, pork steak, and pork loin were fit for any competition. Also, know that because this concoction is ground really fine that it can be used as a dry marinade if left on the meat long enough before cooking. Thank you Rob for putting in all the work so we could enjoy the results of your hard labor. If you are still looking for a great pork rub, then we encourage you to give this flavor maker a whirl and we don’t think you will regret it. You can find more info about this new product on their website www.RobsRibRubs.com. You can also find these products on Amazon.